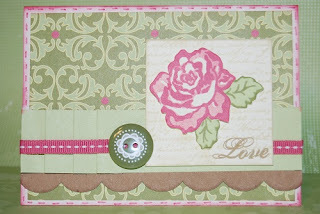 Welcome to day #3 in our Valentine's Day Countdown Linky Party! If you are receiving this posting via e-mail be sure to go to my blog to see the rest of the artwork posted by fellow CTMH sisters as we countdown the days to Valentine's Day! I'm loving the new Kraft self-adhesive borders in our brand new Spring/Summer Idea Book. You get 50 12" self adhesive borders for $5.95 (2 each of 25 different patterns/widths) to add to cards, layouts, etc. These are absolutely brilliant and so fun to play with! You can ink them up, cut them, fold them, use them as masks - I'm still playing with them to discover more uses! Check out the button on this one - did you know you can use Rub-Ons on top of buttons? I also like to use my Rub-ons for fancy pedicures. You can put Rub-Ons and our bitty sparkles on your toes and then seal them in with a clear top coat. Makes for a beautiful and very inexpensive pedi! Love the card and the kraft borders! I forgot to order them. I took a break from the clear cards today! Fabulous, Paige! I love the colors. Thanks again for hosting the hop! This is so much fun! What a gorgeous card! Love, love, love those cards! Very pretty card. I need to order the Kraft Borders now!